NYC, 02/28/2019, 2:00PM. No Time for Sergeants (1958): Comedy at the Air Force. Will Stockdale is a country bumpkin drafted into the Air Force and too dumb to realize he's driving everyone around him crazy, no one more than Sergeant King. 119 min. Director: Mervyn LeRoy. Starring Andy Griffith, Myron McCormick, Nick Adams. The film is based on a play inspired by the original novel. 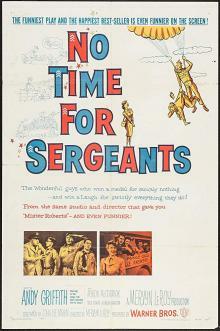 No Time for Sergeants was a major hit, and was largely responsible for launching the careers of Griffith and Knotts.